If you’re looking for mindfulness activities for kids, you’ve come to the right place! I was first introduced to the concept of mindfulness about 3 years ago. I was going through a very stressful season in my life, and someone suggested I enroll myself in mindfulness classes as a way to help me cope with the chronic anxiety I was feeling as I tried to keep up with all of the demands I had on my shoulders. Of course, I was far too busy and overwhelmed to give the suggestion much thought, but when I started experiencing semi-regular panic attacks, I knew I had to do something. So I started researching, and the more I read, the more I realized that mindfulness goes far beyond simple meditation. There are so many other ways it can be practiced, and with more and more children being diagnosed with anxiety disorders, learning disabilities, and developmental delays, mindfulness is gaining popularity among therapists, teachers, and parents as a way to help improve focus, self-regulation, and social relationships amongst children while simultaneously helping them manage feelings of anxiety and depression. We’ve shared our favorite mindfulness activities for kids below, but before we get to those, let’s take a closer look at mindfulness for kids: what is it, why is it important, and how can you teach mindfulness to kids at home, in the classroom, and in therapy? Many people find the concept of mindfulness to be a bit obscure and hard to describe, but if I had to define it in simple terms, I would characterize it as our innate ability to be fully present in the moment – to focus on where we are and what we’re doing without allowing other, intrusive thoughts, worries, or fears to permeate our minds. When we’re practicing mindfulness, we’re impartial and non-judgmental to what’s happening around us, and when our minds wander, we redirect our thoughts back to the present moment. Mindfulness sounds pretty simple in theory, but we live in a day and age where we are encouraged to overschedule our time – and the lives of our children – as much as possible, and it can be surprisingly difficult to focus on the here and now without letting all of the things that are vying for our attention to take hold and send us into a stress-induced state. But when we take the time to learn the art of mindfulness, and teach these skills to our children, the benefits can be pretty staggering. Children of today are growing up in a much different world than previous generations. Kids used to spend their afternoons and weekends playing outdoors without adult supervision, but instead of continuing this tradition and allowing our little ones run to off steam with the neighborhood kids after school, we spend all of our free time driving them from one activity to another. And the moment they get antsy, we immediately toss an iPad or smartphone their way to help keep the peace. Our kids never have the chance to experience the wonderful world of boredom. They don’t get to switch off, tune the world out, and find their inner creativity like we did when we were growing up. No wonder we’re seeing a rise in mental health challenges like anxiety and depression! 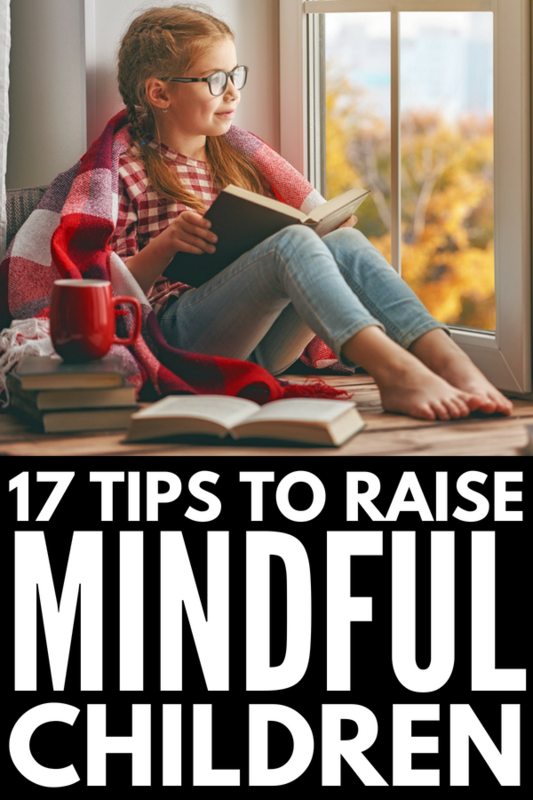 While there are tons of great mindfulness activities for kids you can use both at home and in the classroom, figuring out how to teach mindfulness to kids can feel a bit overwhelming, particularly in younger children and those who have trouble sitting still. The good news is that it really doesn’t need to be that complicated. It just needs to be intentional! Here are 6 tips for teaching mindfulness to kids to help you get started. Practice mindfulness yourself. Before we can successfully teach anything to our children, we need to have a working understanding of the concept ourselves. Take the time to learn the basics ahead of time and make sure your child sees what you’re doing to help raise her interest. Kids learn by example, and the more you demonstrate the positive effects mindfulness has on you and your well-being, the more interested and open your child will be to trying it herself. Get your child involved. As with most activities, the more involved your child is, the better. Set aside some time to explain what mindfulness is and why it’s important, and then go through the list of mindfulness activities for kids we’ve shared below to pick out a few that interest your little one. Go on a shopping trip together to buy any supplies you might need, make a ‘Mindfulness Calendar’ that outlines which days you’re going to try different exercises and activities, and take the time to evaluate them all to decide which ones you enjoy and would like to try again. Start small. Remember that mindfulness doesn’t need to be a long and elaborate affair, and you are most likely to maintain your child’s interest in practicing together if you start small. Pay attention to your child’s cues, and go from there. Make it a habit. Allocate time each day to practice mindfulness together, and make sure to choose a time that works best with your schedule – first thing in the morning, after school, before dinner, or at bedtime – and then make it a habit. The more consistent you are the more benefits you’ll see! Get moving. Contrary to popular belief, mindfulness activities aren’t all about sitting quietly with your eyes closed while meditating. There are lots of mindfulness exercises for children that involve movement, and if your little one struggles to sit still, these may be a better option for her. Be patient. And don’t expect a miracle. Teaching mindfulness to kids can be extremely beneficial, but remember that change takes time and it’s unlikely that you will see an overnight transformation in your child. As with most things, consistency is key! The Bubble Blowing Technique is one of the best mindful breathing techniques for very young children, as it allows them to learn through play. To make it work, give them a small container of bubbles so they can practice blowing bubbles with a wand. They will learn quickly that if they blow too hard or too fast, the bubble will burst before it has time to take shape. But by blowing slowly and with purpose, they can blow a perfect bubble. Have them practice the technique with real bubbles before removing them and letting them use only their imaginations. This is a great mindfulness activity for kids as it helps them stay in tune with their senses. To play, have your child close her eyes – or tie a piece of cloth over her eyes so she can’t peek – and then ask her to use only her sense of touch, taste, and smell to figure out what the food is she’s eating. You can make this as easy or hard as you would like, and it doubles as a fun way to get kids to try new foods! Also known as a ‘glitter jar’, this is simply a jar filled with glitter, glue, and water, as well as any other props that appeal to your child. They are easy to make and can be extremely soothing as they help decrease anxiety and fear while also helping with anger management. The act of shaking and watching the contents of a calm down jar settle forces the body to focus, which in turn allows your child to organize her thoughts and ‘center’ her nervous system. The idea is that, as the items within the calm down jar fall, so will your child’s heart rate and rapid breathing, allowing her to gain control over her emotions. To make your own calm down jar, mix glitter glue with hot water, add a few drops of food coloring and whisk vigorously until the glue ‘melts’ and mixes properly with the water. I don’t follow a specific glue/water ratio when I make mine – I just sort of throw it all together and hope for the best, LOL, but you can adjust to your preference. Next, add additional glitter, whisk vigorously one more time, transfer the mixture into your clear jar (I use an old Gatorade container with the label removed), and top the bottle up with water so it’s completely full. Allow the water to cool to room temperature before securing the lid with glue (I use a glue gun) to ensure it is properly sealed and won’t leak. Fill a paper bag with various objects and ask your child to stick her hands in and guess what they are using nothing other than her sense of touch. This is a great sensory activity and can be extremely calming as it forces kids to focus only on the task at hand. Just be sure to tread carefully if your child has sensory sensitivities – if you add textures that cause her stress, it will have the opposite effect! Mazes are one of my favorite mindfulness activities for kids as they are highly effective in helping children calm down and focus when emotions are high. I found this collection of ‘mindful labyrinths’ on Teachers Pay Teachers, which can be used as finger labyrinths or completed with a pencil. You can use them to set-up calming stations within the classroom, or keep a few in your purse to help your child calm down when she feels anxious or stressed while on-the-go. I’ve recently noticed adult coloring books for relaxation popping up at book stores everywhere, which got me thinking about how coloring can double as a helpful mindful exercise for children. Instead of just mindlessly coloring and chatting together after school, have your child say the steps she uses to color outloud as she completes them – ‘I am coloring’, ‘I’m going to coloring the flower pink’, ‘I’m picking up the pink pencil’, ‘coloring helps me feel calm’. The idea is to train your child to say these things quietly to herself over time to keep her focused on the task she’s completing, and to teach her how to use coloring as a mindfulness tool when she’s feeling anxious or overwhelmed. A list of mindfulness activities for kids wouldn’t be complete without guided meditation scripts! There are so many to choose from online, but I like this collection of 30 guide meditation scripts I found on Teachers Pay Teachers best as they can be used both in the classroom and at home to help kids find their way to a place of calm, help them focus, and improve their productivity. Some of the best mindfulness activities for kids are those that encourage children to focus on their breathing. When a child takes deep, meaningful breaths, they unconsciously bring themselves back to a place of calm. A great way to do this is to create straw painting masterpieces with your kids! All you need to do is plop some watered down watercolor paints on a piece of paper, and then ask your child to spread the paint around by blowing air through a drinking straw. It’s simple, fun, and effective in getting kids to calm down and concentrate. A friend of mine had a zen garden on her dining table when I was growing up, and I loved it. I found the act of ‘raking’ the sand so relaxing, particularly when we were studying for a test together. You can buy a zen garden for kids to use when your child has trouble relaxing and focusing (i.e. while completing homework), or you can easily make your own (a great mindfulness activity for kids!) using a small cookie sheet, sand, stones, and a fork. If your little one struggles with impulsivity, emotional regulation, and anxiety, these self-regulation flash cards are a great mindfulness exercise as they provide breath and movement exercises kids can practice to help them focus, calm down, and manage their emotions. You can complete these with the students in your class or use them as an independent activity kids can do when they feel overwhelmed, and they make for a great way to de-stress as a family at the end of a long day. Don’t be afraid to make this fun instead of serious – laughter really is the best medicine sometimes! I Can Handle It (Mindful Mantras). What I love about this book is that it presents different situations that may upset a child, presents possible ways to deal with each of them, and then reminds the child to use the ‘I CAN HANDLE IT!’ mantra, which can be extremely empowering to a little one with big worries. Listen to My Body. This is a great book as it helps kids understand the connection between their feelings and the physical reactions they experience as a result of them, what they need to do to regulate those feelings, and how they can be more mindful about them. Breathe Like a Bear. Filled with 30 mindful breathing activities, this is a great book to introduce kids to the wonderful world of mindfulness and equips them with strategies they can use to regulate their breathing anytime and anywhere! If your little one struggles to concentrate and focus, lacks appropriate self-regulation skills, struggles with empathy towards others, and/or struggles with feelings of stress, anxiety, or depression, I hope these mindfulness activities for kids inspire you to find ways to connect with her and teach her how to bring herself to a place of zen each day so she can better cope with the world around her. If you found this collection of mindfulness activities for kids helpful, please share this post on Pinterest! And if you’re looking for more ways to connect with and have fun with your kids at home, please follow our Parenting board where we share all kinds of fabulous ideas we find each day!